Happy Halloween! In the spooky share today are a large amount of creaky carrots (a big scary haul of em! 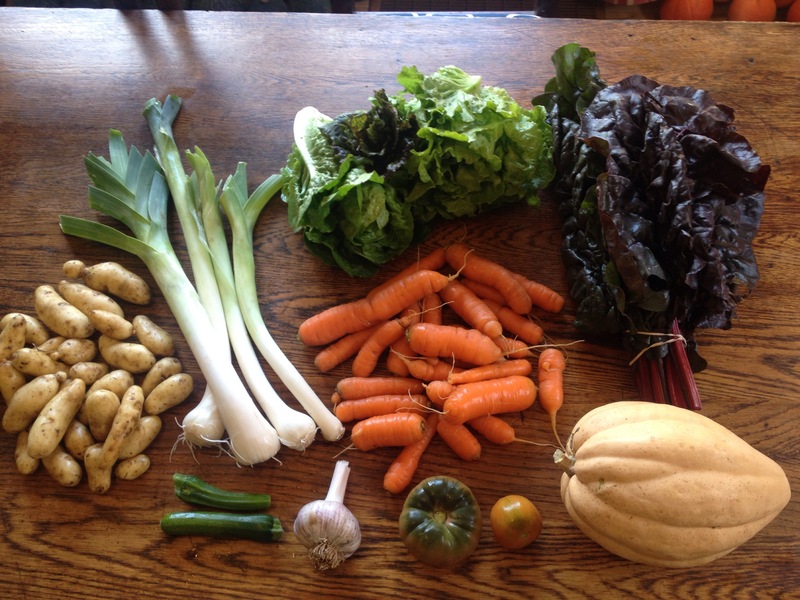 ), freaky fingerling potatoes, lecherous leeks & lettuce (3 kinds of lettuce! though some are quite small), treacherous Thelma Sanders Sweet Potato acorn squash (a Missouri heirloom & quite good I think), two tyrannical tomatoes, zombie zucchini (a tiny morsel), gross garlic, and charred chard (ruby red variety). So the tomatoes may be done, maybe not… that cold weather got to them this past week. The cucumbers look very done. The zucchini is done for sure. It’s sort of nice that we were able to stretch summer in a manner of speaking all the way until November 1st! The lettuce will probably have one more week and then we’ll move into the realm of escaroles and radicchios for salad greens. Next week I think we’ll take a break from potatoes as I know we’ve had quite the run of them. Look for turnips instead next time. Squash, leeks, and garlic will probably keep rolling til the end. As will carrots, beets, and various types of braising greens. Out to catch this nice sunny day! Happy November, Matt.